We supply an encompassing range of laboratory incubators that are used in various clinical and pathological applications all over the world. Made from premium quality steel and allied metal alloys, these incubators are provided with digital controls to accurately control the temperature. Our range of incubators is available in custom-made designs and conforms to international quality standards. 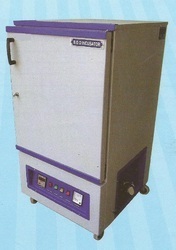 Emerged as a leading company within this domain, we are engaged in manufacturing and exporting BOD Cooling Incubator. These incubators are available for the clients in different sizes and specifications, in order to meet with their wide requirements. Our offered incubators are demanded within various laboratories for preserving chemicals and reactions. Biological labs for preservation of vaccines (insulin, liver extracts etc. )Serological and compliment fixation tests; Enzymatic digestion process and General low temperature uses in physical /chemical labs. Double walled cabinet insulated with 75mm thick super fine mineral wall. Outside-epoxy powder coated ms sheet. Inside chamber-anodized aluminium. Three adjustable anodized shelves (perforated) Temperature controlled by imported double action hydraulic type thermostat-5°c to 50°c ±1°c sensitivity. Evaporator coil, sealed heating and thermostat sensing element are in the airrr duct at the back. F. H. Motor's two fans for inside air circulation. 'l' shaped prismatic thermometer -0°c to 50°c. Well protected noiseless compressor alongwith a fan cooled condensing coil. Full view inner acrylic door for inspection. Outer door-double walled fitted with magnetic gasket. Door operated illumination lamp. Control panel with three indicators-main, heating & cooling. Volt meter, temperature setting knob, selective switch for above & below the room temperature. Power supply-220/230 volts a. C. 50 hz. Electronic digital read out, timer and interior illumination (optional) Voltage stabilizer to regulate line voltage necessary. We have a long list of satisfied clients all over South-East Asia, SAARC Countries, Parts of Europe and Africa. 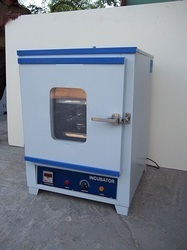 Chamber size 12" x 12" x 12"
We are the manufacturer, supplier and Exporter of Oven Incubator. These are manufactured by a team of deft experts employing latest machines and tools. To meet the diverse requirements of the customers, we offer all our Incubators in different sizes and specifications. Double walled Construction inner chamber made of Mild Steel/ St. Steel & exterior made of G.I. sheets powder coated .The gap between the two walls filled with glasswool insulation. TECSONIC Platelet agitator specially designed to Platelet Agitator in continues motion at a fixed speed of 70 RPM. Maximum 36 standard Platelet bags can be accommodate at a time. 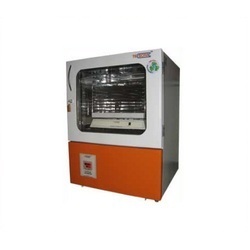 Techno digitally controlled model bacteriological lab incubator is a double walled chamber with interior made of SS 306 grade sheets & exterior made of cold rolled mild steel sheets finished in epoxy powder coating. Inter space in between walls is tightly packed with glass wool to minimize radiation heat loss. The inner chamber accommodates SS perforated trays at adjustable height. A double walled insulated door mounted on heavy duty hinges & provided with locking arrangements. Temperature is controlled by a digital temperature controller working in conjunction with PT100 sensor housed in the hot zone. 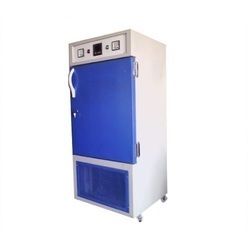 Air circulating fan assembly driven by suitable motor is incorporated in the unit of maintaining uniform temperature inside the working chamber. Adjustable air ventilator is provided at the top. Built in front control panel accommodating pilot indicating lamps, ON/OFF switch, digital controller are located at the lower portion or at the right side of the chamber.